First and foremost, I would like to say that this was a very eye-opening project, and one that I really enjoyed! Over the course of this blog project, I feel like I was able to hone down on my writing skills as well as my ability to appeal to a broader audience. I think I was able to achieve this in the ways I structured the posts, that being my short posts focusing on one specific artist/photographer and my long post being a more in depth analysis of how art was influenced by the Civil war in general and vice versa. In structuring the posts this way, I believe I was able to give the readers a good mix of material that related to the Civil War and yet was different enough each week to keep it interesting. In continuation, I feel that my research skills improved as well throughout the course of this project. Due to the type of posts I was creating, I had to research information for every post, not just the long ones, and in doing so I was able to learn more about my topic that I maybe otherwise would not have. In researching, I also learned more about how to glean out information from scholarly sources that were different from the straight research articles I was used to. Since my topic focuses heavily on art, many of my sources were actually artists statements derived from museum themselves, such as the MET and the SAM, so I had to really cultivate my skills of extracting necessary information without getting caught up in the details of each piece. In addition, the use of the analysis also helped me tremendously in cultivating concise yet powerful writing skills as well as allowing me to make an argument on a topic that I got to choose, and was therefore passionate about. However, that also came with its struggles, as due to my immense love of art, I found it difficult to step back and write to a general audience. In the beginning I struggled with this, as I tended to go overly in depth with meanings behind details within paintings, (which I found fascinating but soon learned that not everyone else did), as displayed in my first short post “weekly spotlight: Winslow Homer.” I soon realized that I was writing more for myself and with my own interests in mind rather than trying to appeal to a general audience, and so I changed by angle of approach. Instead of babbling about art and how amazing it was to me, I tried to show the audience and let the images speak for itself. I began adding more images to each post, in an attempt to draw in the reader more, and added less analysis about the picture itself but instead wrote about how the picture was received by society during the time. I think that in doing this I bored the reader less, and (hopefully) caused them to if not get excited over the power of art, to at least understand its importance in causing change. I think I was able to accomplish this with my analysis post, “Reality Check: How Art and Photography Shaped the Civil War,” and in my implications post as well. Overall, this project was something I really enjoyed as I got to learn about history through the lens of art, which in turn made it fascinating to me and caused the information to have much more of an impact. I think that by letting each person chose what topic they wished to pursue, it really made this project enjoyable rather than a laborious assignment, and personally I think I learned more about the Civil War and its many elements this way than I would have if we did some sort of traditional assignment. Over the course of this project, I learned an immense amount about art and photography during the Civil War, and more importantly, the ways in which it influenced the public sphere and helped turned the general attitude against the war and against slavery (among the other issues being fought for). I didn’t realize just how important the use of art was during this time in forcing people to see the reality of the situation at hand, but then I felt that I should have known its significance as art as a whole has always been the tool for creating awareness and making change. Therefore, an implication that can be taken away from this is the ways in which art serves as a weapon. Without it, people can remain ignorant of real world problems that occur, or worse, be indifferent to them. 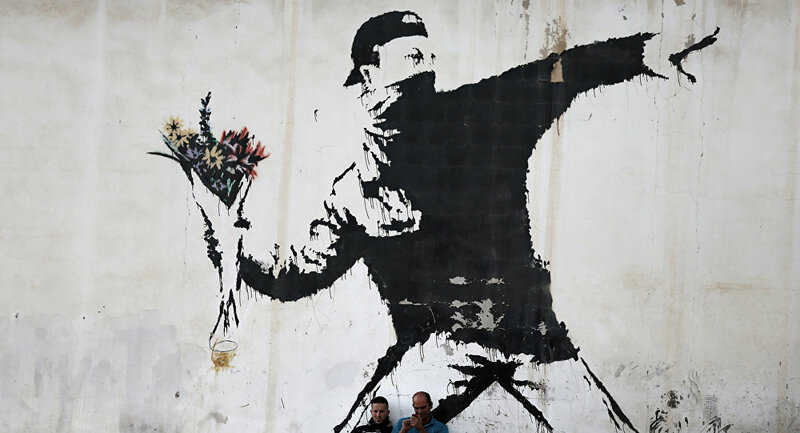 Art in its purest form is a type of social commentary, as shown through the graphic images displayed during the Civil War to even today with street artists like Banksy, whose graffiti exists all over the deserted bomb sites of the Middle East. It is a peaceful yet powerful way to create perspective and cause change. Without awareness, there exists no conversation, and problems remain and go unnoticed. It is through this medium that attention is called to pressing issues, from social justice to human rights atrocities, and change is able to be made. For this blog, my topic focused primarily on art and photography during the Civil War and the ways in which the war affected it, and vice versa. I explored specifically the development of realism during this time period and how that helped change the public’s opinion of the war. For example, much of my research was spent finding information on how photography and paintings depicted the war for what it really was: a bloody massacre rooted in human rights atrocities. The most compelling piece of evidence I found was in the photographs put out by Matthew Brady. He was a pioneer in the field of photography, and he was the first person to ever photograph the war explicitly and then distribute the photographs to the public. His photographs were therefore the catalysts for changing the tide of the war opinion, from patriotic to repulsion, and it was because of him and his photos that the Civil War went down in history as the most bloody and severe war, and exposed the South’s faults indisputably. Therefore, it is because of these breakthroughs in art and photography that birthed the form of photojournalism and modern art that exists today. Before starting my research, I never knew just how significant art and photography was during this time. It was through this topic and project that I was able to develop my theory that without the prevalence and use of art during this time, not only would the war have continued for longer than it did, but also the South would not have been exposed in the way that it was. The changes that occurred from the war would have been less momentous in historical importance and it is very likely that African Americans would have remained dehumanized for much longer than they did. Eastman Johnson was a portraiture painter who, during the Civil War, set out to “save the soul of America” with his paintings. Born in 1824 in Maine, he began his career by painting portraits of important figure heads in the Union. He traveled to Germany to study art at the Düsseldorf Academy, and came back to the US when the war broke out. During this tumultuous time, Johnson’s paintings revolved around what were considered “touchy” subjects at the time: slavery, abolitionists, and suffering caused by the war. He felt the need to spread awareness of the root of the war through his paintings, and he did just that. Over the course of his career, Johnson portrayed the unthinkable: slaves reading books, slaves being liberated, a black family singing and enjoying life, black men reading the Bible- all in an attempt to break social codes and call attention to the inhumanity of depicting slaves as subhuman and highlighting the need for equality. It was through these paintings (that were exhibited around the country) that the idea of slaves and African Americans being equivalent was planted in the minds of countless citizens, and over the course of the war, became the sole issue dividing the North and the South and the reason behind fighting: to end slavery once and for all. Over the course of this unit, I have been following the blog by the username “civilwar0226.” They sign off all their posts “-B” and specifically they have been focusing on the lingering racial tendencies that started during the Civil War but never ended. What I found intriguing is that they created multiple blog posts on the Charleston shooter Dylan Roof, and with each post they wrote about the event with a different angle (racism, childhood trauma, etc). This really opened my eyes to the depth of which these racial tendencies can run, and I really enjoyed this different perspective, so go check them out! Another blog I have been reading over this unit is from “North Star,” who would write a lot about Abraham Lincoln as well as other generals and their roles during the war, which I appreciated because they took a more traditionally historic approach. Another thing I loved about this person is that more often than not they would insert something about baking, writing that they were currently baking a cake and writing their post or saying how they wished we could smell what they were making today. I really enjoyed the blend of historical facts with random baking commentary, and I think it made their blog fun to read as well as informative, so go check them out! The colloquialism “seeing is believing” is a term that highlights the human need to visually observe something in order to understand its portrayal. This human need is met through visual aids such as paintings, documentaries, photographs, and other sources that accurately depict and convey truths about reality, which aids in the construction of any belief. This theory was proven during the Civil War, where art and photography were used for the first time to sway public opinions about the reality of the war by spreading news visually. Therefore, due to these new perspectives that emerged, art and photography became the basis for changing the general attitude towards the conflict, by depicting the war monstrosities realistically instead of ideally to the public. Paintings during the Civil War were employed for the purpose of illustrating both the reality of the battles and the metaphorical undertones of the war which informed and swayed the public opinion. During this time period, artists were sought out to create renditions of battles for newspapers, journals, and magazines which were then mass produced to the public. These paintings included battle scenes and their aftermath (corpses strewn over the fields), as well as personal depictions of family members left widowed or fatherless from the war (most famously Eastman Johnson’s “The Girl I Left Behind Me”) , each of which struck emotional chords with the general public and caused severed adversity to the war. 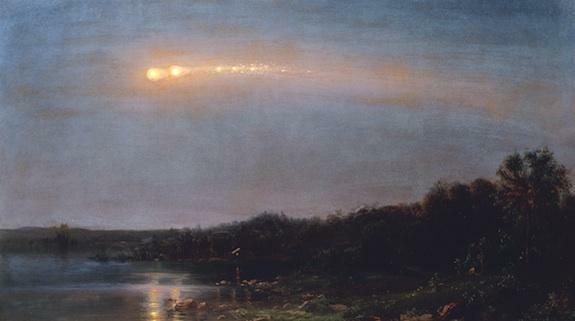 For instance, during this time period Union artists such as Friedrich Erwin Church would employ the use of color and subject matter in order to portray a deeper, metaphorical message, such as dark skies and clouds representing uncertainty and tensions looming, meteors representing the force of John Brown throughout the Union, and rocky terrain depicting the turbulence of the war and the destruction to both sides. Thus these painters utilized a type of non-verbal appeal to the emotional psyche of the public, rendering them anxious at what the war had done, and what it would continue to do. In continuation, art during this time period proved crucial in illuminating dividing issues that existed in the country. 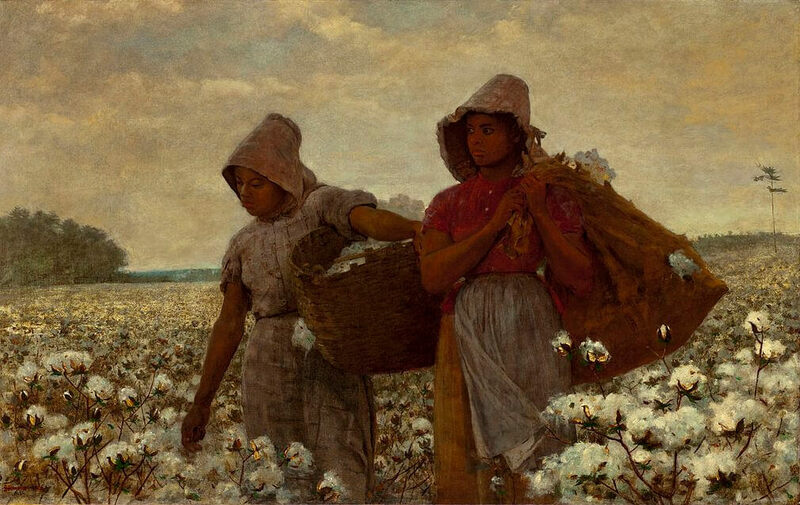 The most successful painter to accomplish this was Winslow Homer, whose controversial paintings depicting complex issues such as slavery, prisoners of war, and the tiresome attempt at reconstruction caused him to become one of the most feared yet respected artists of the time. Working for the Union and selling his landscape paintings to newspapers, Homer quickly realized his platform as an artist gave him the ability to reach a wider audience, and thus he began creating work surrounding the core issues of the war. He did not hold back. Creating depictions of freed slaves having standoffs with their former owners, portraits of black female slaves in the cotton fields planning their escape, and scenes of prisoners of war taken from the confederacy, Homer depicted each and every one of these with the intention of stirring conversation, which he hoped would lead to positive change and an end to the bitter war. And he wasn’t the only one. Many artists during this time (Eastman Johnson, Sanford Gifford) began to realize that the crux of the battle was over the issues of slavery and breaking southern traditions, and thus began attempting to create art to discuss this. However, although many artists attempted to convey the north and the south equally, the reality was that the majority of artists during this time were northerners. Due to the way the war was going and the overall historical presence of art in the United States, there existed very few artists in the confederacy, and those who were there were extremely limited to supplies and finances. Nevertheless, the few paintings that did emerge from the south were extremely construed and did not accurately portray the current situations of the confederacy. 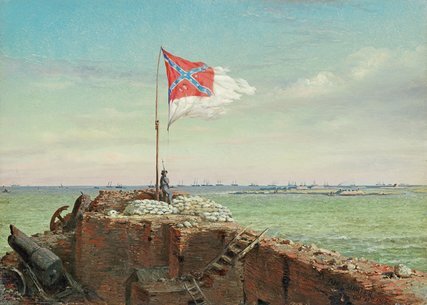 For example, one of the more prominent confederate painters Conrad Wise Chapman only painted idyllic scenes of the south: the sun setting over the confederate fort in the Charleston Bay, the confederate flag waving in a light breeze- all extremely cheerful and entirely inaccurate of how the war (and those places) actually looked. This of course lead the Union artists to take it upon themselves to depict the south as they believed it to be. Thus emerged paintings of lone veterans in a field, hoping to rebuild their land (“A Veteran Returns From War” Homer, A white woman, her slave, and a confederate soldier hiding from firing shells, “Civilians Under Fire at Vicksburg National Park Service”, and countless other interpretations of how the North believed South looked during this time. Although not entirely wrong, the lack of actual representation from the South (and very twisted little representation actually presented) led to the war opinion, both nationally and internationally, to turn towards favoring the North. Furthermore, the most groundbreaking advancement that changed the tide of the war against the South indefinitely was the creation and utilization of photographs. Before this time period, photography had not been truly established, and with the rise of conflict came the opportunity to document, and thus mass media and photojournalism erupted. The war quickly became the most photographed event of the century, and for the first time the general public was able to not only read about the war, but actually see it for themselves in its murderous entirety. This was unheard of prior, and it quickly became the most necessary tool for changing opinion of the war from patriotic pride to utter horror. This was in large part due to the renown and avant- garde photographer Mathew Brady, who established a team of photographers specifically for documenting the war and its effect on everyday life. Now for the first time there existed photos ranging from bodies lying dead on the battlefield to portraits taken of young soldiers for family keepsakes. In fact, without the use of photographs the war would have remained distant and obscure to the civilians involved. It was because of these photos that the public was forced into accepting the harsh realities of the war, as these photos by Brady “brought home to us the terrible reality and earnestness of war. If he has not brought bodies and laid them in our door-yards and along the streets, he has done something very like it…” . Thus, these photographers and artists served as types of visual philosophers, challenging the perspective of the civilians and forcing the severity of the war into the public forum of discussion, in the effort (and achievement) of finally ending the conflict. Therefore, it is through these breakthroughs in realism within the realms of art and photography that the Civil War was established as the notoriously violent conflict rooted in human rights atrocities that not only tore the country apart, but also shaped the present day ideas of the North and the South. It is because of these unapologetic portrayals of the war through the paintings and photos that caused the general public to become inevitably affected, and due to these emotional appeals, the surge of resistance which resulted finally ended the bitter war for good. One of the most prominent yet unheard of artist during the Civil War was Conrad Wise Chapman, a painter for the Confederacy. 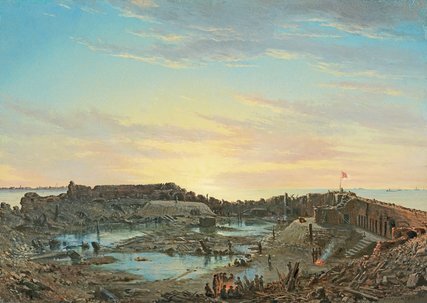 Known as the “South’s Forgotten Painter,” Chapman was quickly dismissed once the war was won by the Union. But during the duration of the conflict, however, he became the spokesperson for the South. His paintings depicted the idyllic and almost otherworldly beauty of the south: picture perfect settings of the Charleston Harbor, majestic sunsets over the confederate flag, picturesque scenes of the landscape of the untouched south. It was a depiction of Southern pride if anything, and from a Confederate’s perspective, it was the beauty of their homes and the traditions of their ideals that was worth the bloody war. Given this background, it was no wonder that Chapman was quickly forgotten after the war. His art had a warped sense of reality, one that did not actually exist during the war, as the reality was that artists in the South struggled to even get supplies or make money off their work, let alone finding patrons to display their work, since the majority of art patrons were from the North. Therefore, although a talented painter, Chapman’s work remained within his family and was eventually donated to sympathetic patrons. If the south had won, perhaps his name would have been more well known, but alas, he was on the wrong side of history. Photographer and innovator Matthew Brady was known as the “father of photojournalism” and essentially catalyzed the use of photography to document the Civil War. Raised in New York and exposed to many prominent artists at a young age, Brady was not only inspired but also groomed by them to set out on his own and create. Thus, when the war began, he caught wind of an opportunity to use art to spread news and show the war for what it really was: a catastrophe. 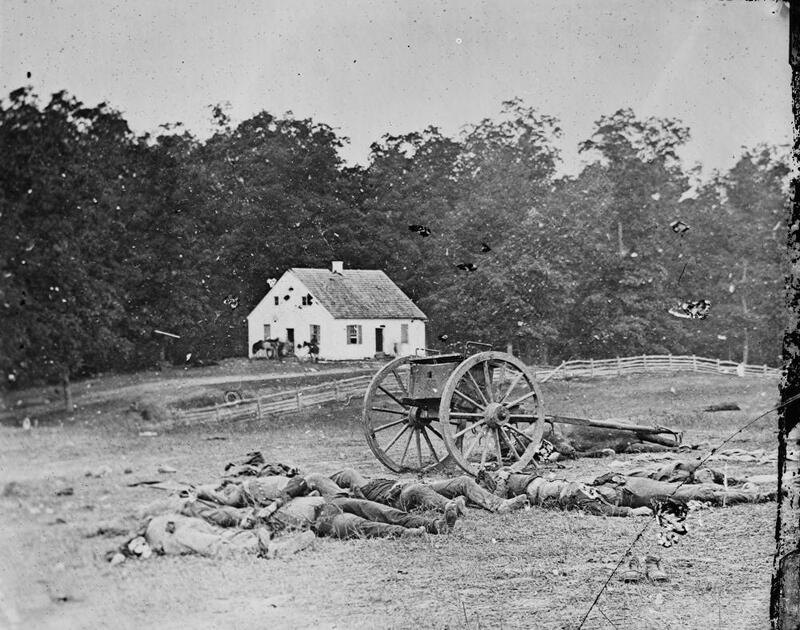 Brady achieved his goal by recruiting a team of up and coming photographers, who he sent out to photograph the aftermath of major battles, including Antietam and Gettysburg. 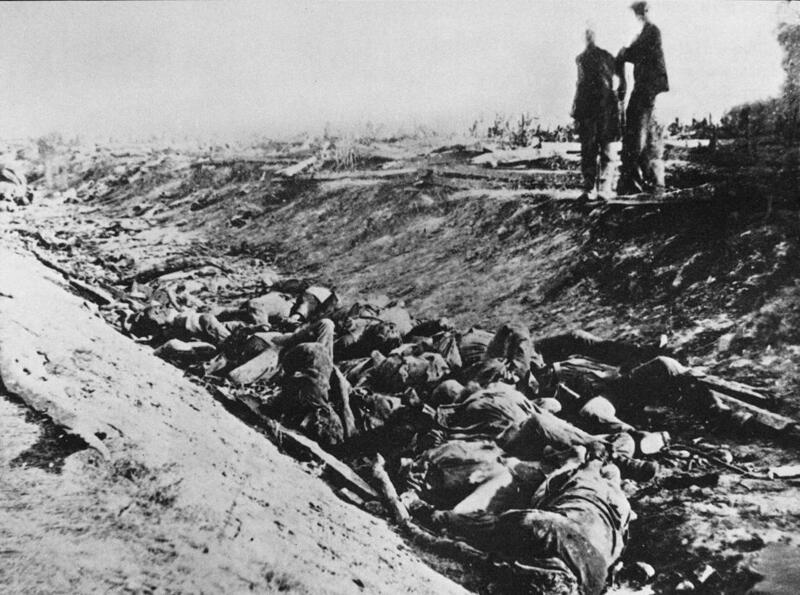 One of his most famous photography series, “The Dead of Antietam, 1862,” became the first series to depict mass carnage and be distributed to the public. The aftermath of these photos were shocking, with the public claiming that “Mr. Brady has done something to bring home to us the terrible reality and earnestness of war. If he has not brought bodies and laid them in our door-yards and along the streets, he has done something very like it…,” proving the way in which his photography impacted the citizens and changed the perception of the war. Although photography got its beginnings about 20 years prior to the Civil War, the war itself was the perfect conflict to catalyze the extended usage and development of photography in America. Without the use of photography during the Civil War, false news and misinformation of how the war was actually going and to what intensity would have been construed, even lost from historical records forever. Photography started primarily as a way to capture images for newspapers and other news outlets, yet it quickly became the most sought after way of following the war. The first official photographer of the Civil War, Matthew Brady, recruited men to his studio and taught them the art before sending them out to photograph. It became a way to document: images taken of young soldiers for their mothers to keep, carnage of the bloody aftermath of any battle, and even portraits of generals for historical records. But through all these types of photographs, it quickly became the raw realistic aspects that captured the public. Never before had an actual war been shared so openly, and the reaction from the public proved that. The dispute between the North and the South began taking its toll on the citizens as more and more of these gory photographs circulated. The artistic aspects in this type of photography were not lost either. Despite the difficult shots, the raw black and white images evoked deep emotions from its viewers. For example, the following image of the aftermath of Antietam displays countless bodies strewn about in front of a church, depicting a deeper meaning to the photograph and playing on elements of religion to evoke a certain response. Thus, artistic photography was born, and further took shape as time went on, proving foundational for American photography as a whole. Therefore, it’s through both the realism of photography (documentations and media outlets) as well as the artistic appeal that allowed the Civil War and its viewers to be transformed by photography.